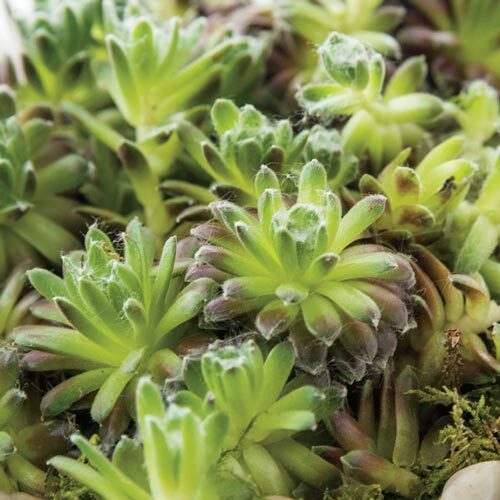 Sun-filled spots, both indoors and out, are completely transformed with the addition of Spumanti Hens & Chicks. 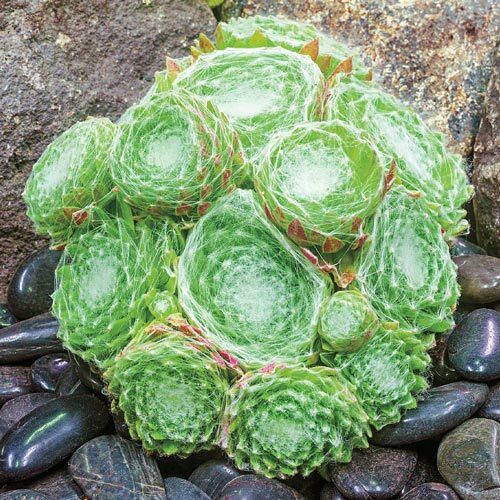 Whether placed in a rock garden, a pretty pot, or used as a drought-tolerant ground cover, this fascinating little perennial adds year-round interest to any space. Fast-growing 2-3" high rosettes of green feature a fine webbing that covers the entire plant like spider's silk; a unique look that will garner plenty of attention. Very easy to grow and maintenance free! Flower FormThe foliage is the real interest with bright green rosettes. Soil RequirementsWater plants thoroughly after planting or transplanting, then allow soil to dry slightly between each watering. Well drained soil. Water when soil is mostly dry. Winter CareNo additional winter care is needed if planted in the ground. If planted in containers, move indoors or to a cool garage. Additional InformationHens, the larger rosettes, generally only live for three years before they die, they produce a center stalk that flowers. Once the flower fades the rosette dies. The empty spot is quickly fill with chicks. Planting InstructionsPlant in sandy soil at the same depth of the pot.